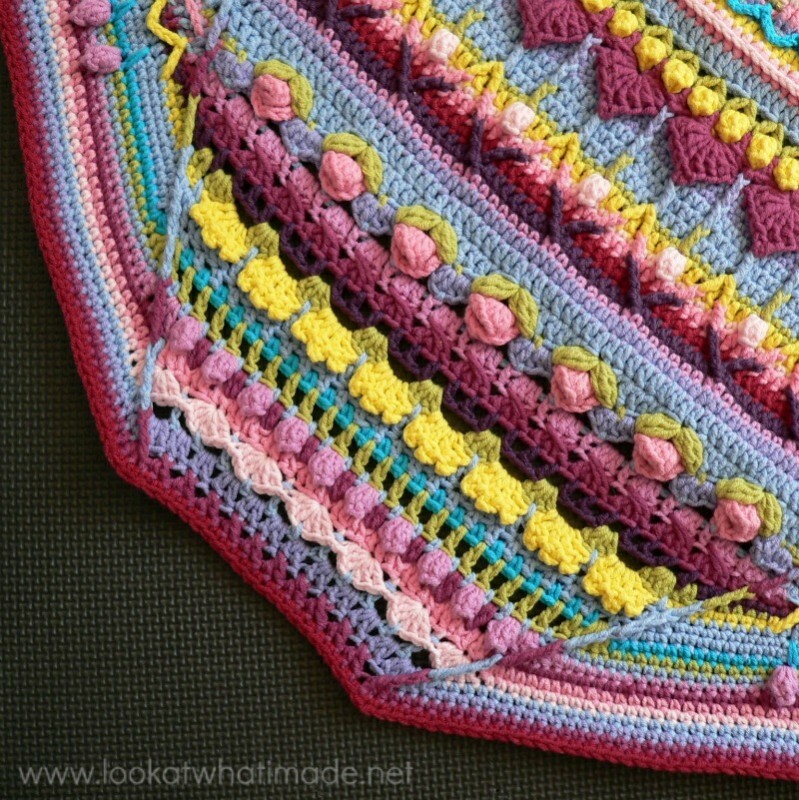 As most of you know, I am using 3 different kinds of Scheepjeswol for the Sophie’s Universe CAL 2015. 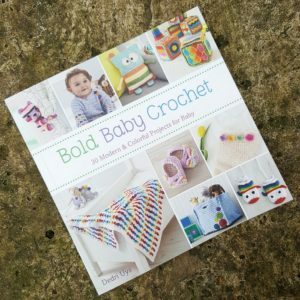 I have been having such fun working with these yarns that I thought I should do a quick post to tell you why I chose (and love) the yarn. Truth be told, I had the Scheepjeswol yarn in my Deramores basket for absolutely ages before I actually bought it. It is more expensive than the acrylic yarns I usually use, but I really, really, REALLY wanted to get some. Every couple of weeks I would go and have a look at my “order”. It made me feel as if I already owned the yarn, even though I didn’t physically possess it. 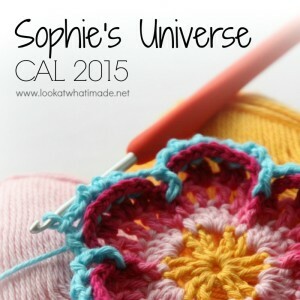 At this point I was working on the prototype for Sophie’s Universe and absolute disaster struck. I’d made a fatal design error and I ended up having to frog the prototype all the way back to the garden. 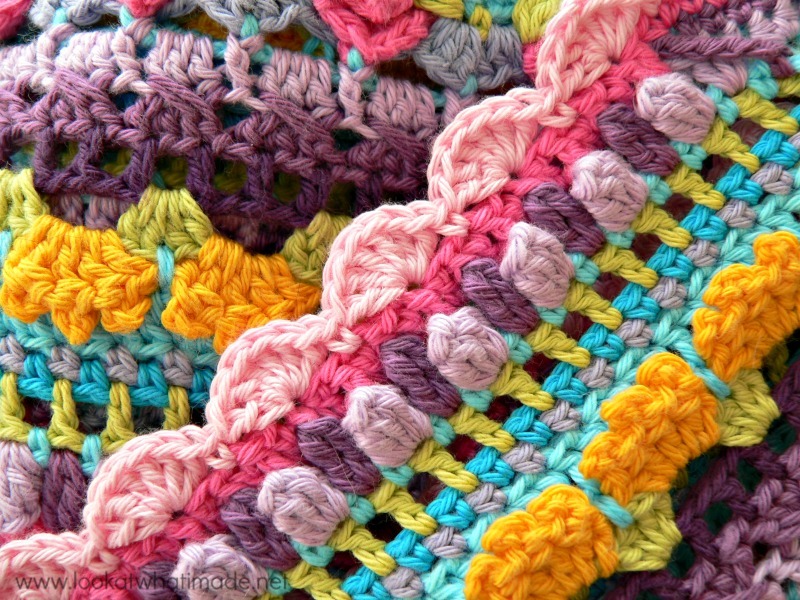 As I spent the next 2 weeks jigging stitch-counts and placement (crocheting on my hands and knees to ensure that she remained flat) I realized that I didn’t want to make 3 more Sophies unless (a) I really liked every minute of working with the yarn and (b) they would last for years and years without pilling – which all my previous blankets were doing to varying degrees. So I ordered a modest amount of Scheepjeswol yarn and started playing around with it. 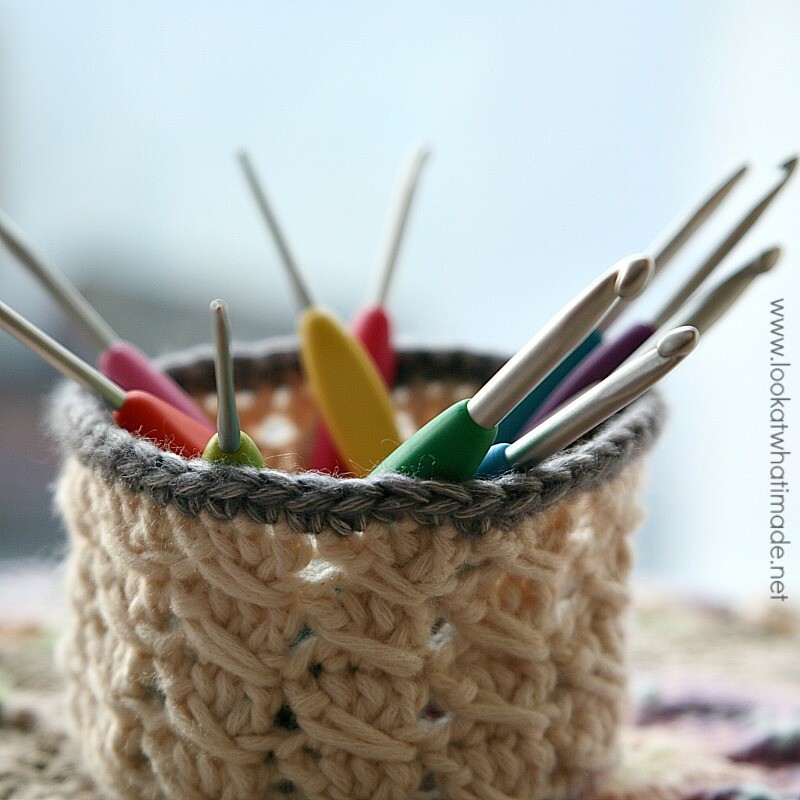 I made a little basket out of the Stonewashed XL (which I now keep my crochet hooks in) and it was an absolute dream to work with…helped, I suppose, by the fact that I had bought myself some Clover Amour Crochet Hooks . I decided that I would invest in the next 6 months of my life and make Sophie with these gorgeous yarns, so I chose Cotton 8, Softfun, and Stonewashed XL. 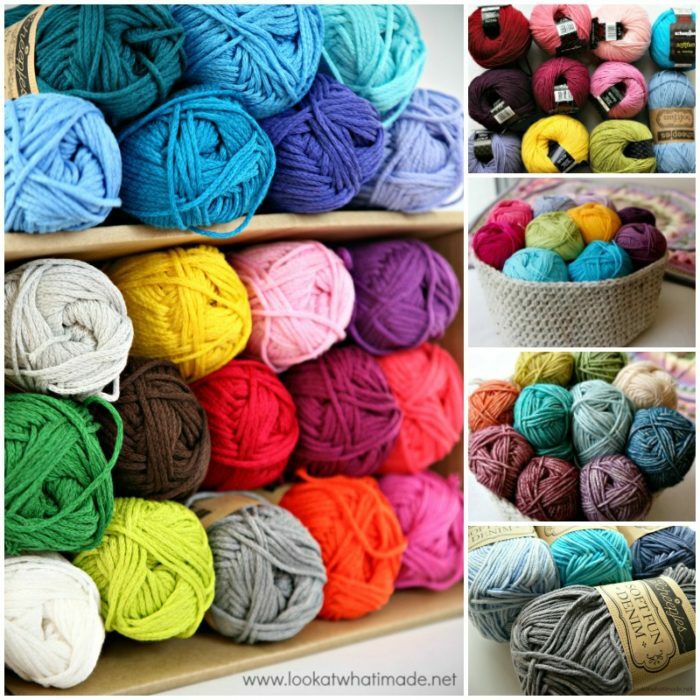 All these yarns are available from Deramores. They offer free shipping worldwide (over a certain amount), and you can change countries by clicking on the flag in the top left-hand corner of the Deramores site. The Cotton 8 is the thinnest yarn I have ever worked with. 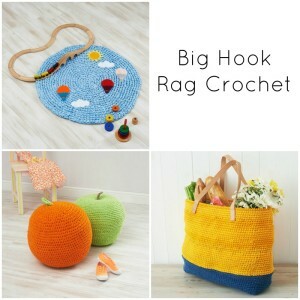 I tend to like my projects to grow quickly so I use the fattest yarn and the biggest hook I can comfortably wield. That being said, I just love the way this thin yarn works up. 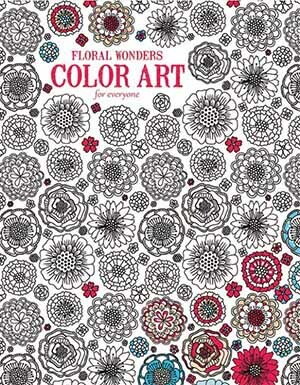 The colours are gorgeous and there are so many of them (47 shades available on Deramores). It washes well and doesn’t split! I am using a 3.25 mm Clover Amour Hook, but it works well with anything from a 3 mm to a 4 mm hook (depending largely on your personal tension). 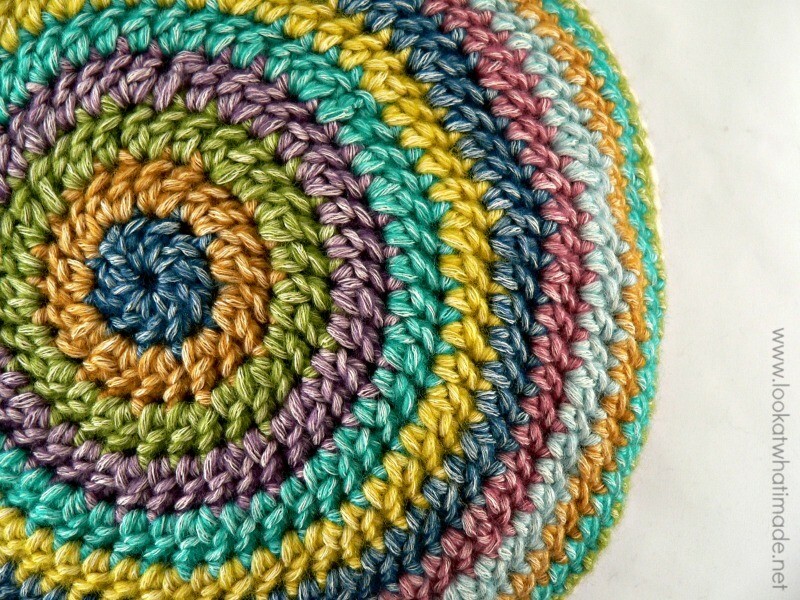 The Cotton 8 for Sophie’s Universe is available in a UK Colour Pack and a US Colour Pack. Alternatively you can find the individual colours HERE. 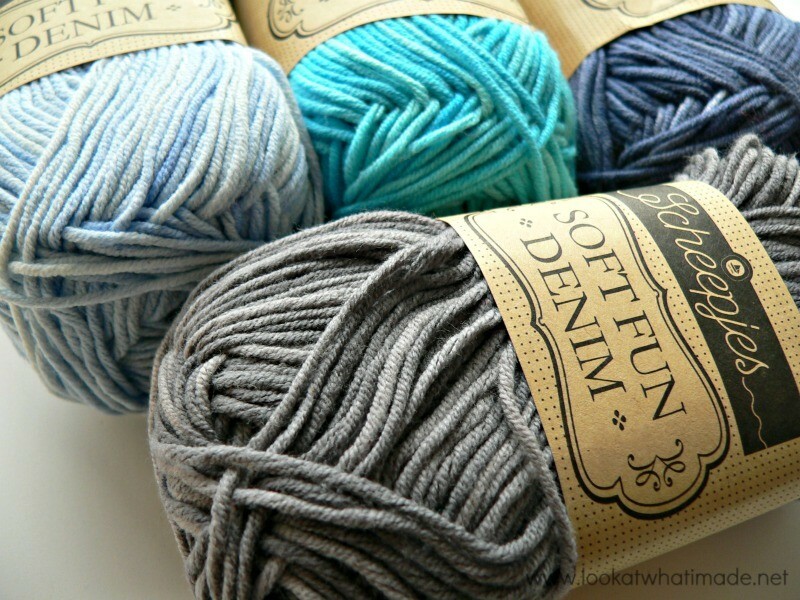 The Softfun is a “comfort” yarn. It doesn’t snag either (have you notice that this is very important to me?) and being a double knit (light worsted weight) yarn, it is effortless to work with and super soft to boot. The colours are more muted, although some of the colours (like Canary and Dark Turquoise) are quite bright. It has a more limited shade-range, with 37 shades available on Deramores, but I have been told that there will soon be more colours. Jenny has been making most of the parts for my Softfun Sophie, so when I had to do a part the other day it was so pleasant to work with it again! I think I’d forgotten how much I love working with the Softfun. There is now also a Denim version of the Softfun (which you can read more about below). 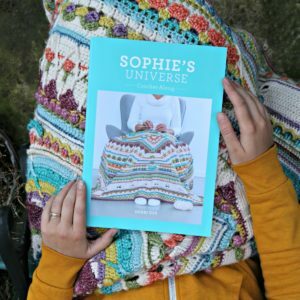 The Softfun for Sophie’s Universe is available in a UK Colour Pack and a US Colour Pack. Alternatively you can find the individual colours HERE. I’ve left the best of the 3 for last. Stonewashed XL is my favourite yarn in the world! Initially I wasn’t so happy with my Stonewashed Sophie. It felt like I was making a mistake with my colour placements and the muted colourway was completely out of my comfort zone. She quickly became my favourite of the three, though. 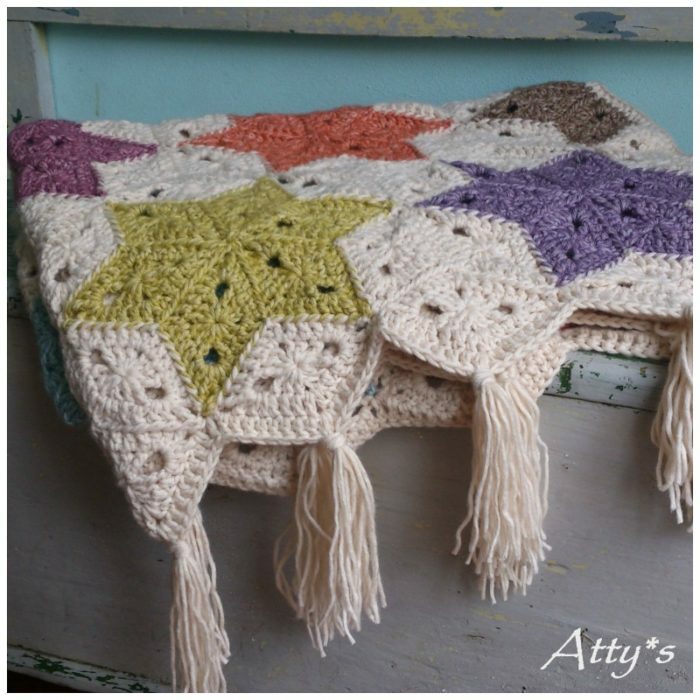 The worsted weight ticks my quick-and-large box and the colours were exactly what I had hoped they would be when I first saw Atty’s’ Star Blanket (which inspired me to choose the Stonewashed XL). The yarn doesn’t snag (it had to be said!) and it is ever so slightly fluffy. Not fluffy in the way yarns are usually fluffy though. It is fluffy in a uniquely different way. The Stonewashed XL is listed as a chunky yarn (recommended hook size 5 mm), but this is purely due to the fluffiness. It works equally great on a 5 mm hook and a 6 mm hook, and using it on a 5 mm hook gives you a tension comparable to most other worsted weight yarns. 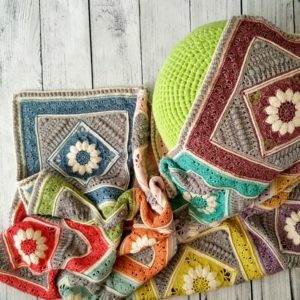 The Stonewashed XL for Sophie’s Universe is available in a UK Colour Pack and a US Colour Pack. Alternatively you can find the individual colours HERE. I have acquired quite a few more Scheepjeswol yarn since the CAL started. I won’t go into too much detail on those until I have got a pattern/project to share with you, but I will give you a quick run-down. The Softfun Denim is similar to the Softun, but in dappled shades. There are currently only 10 shades available on Deramores, but you will find that these 10 shades match very well in pairs, for example Blush and Coral, Taupe and Brown, Light Pink and Fuchsia, or Pale Blue and Indigo. When Kay and Jo brought me my bag (in exchange for some Messy Chocolate Cake), they had a little look-see. I think it’s safe to say that they loved the yarn! Sunkissed is a dappled version of the Cotton 8. It is currently available in 11 shades on Deramores, but those 11 shades are amazing! When I opened my box of Sunkissed, the Oceanside jumped right out at me and I cannot wait to make something with it! The Bloom ticks absolutely all my colour boxes. It is available in 24 shades on Deramores and I ordered every single one! I have been playing around with the Bloom on my commute to and from work, trying to decide what the perfect project would be. So far I have made a bracelet (which is plain, but soft and cute), and a washcloth (which is dense and textured). Right. Now that I have shared my ever-growing stash of Scheepjeswol (and my thoughts on them), I have some exciting news to tell you. 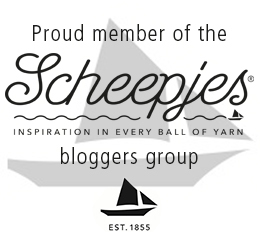 I am now officially a “Scheepjeswol Blogger” (although I suppose I can only really call myself that once I start “officially” blogging for them)! I am so excited about this chance to collaborate with them! Who would have thought, when I started this blog 5 yeas ago, that it would open up so many exciting opportunities for me. 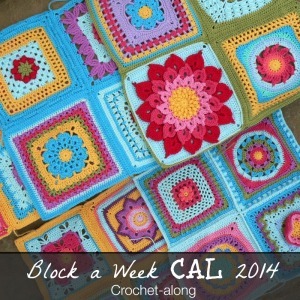 Have a fabulous, crafty week. ps. All the photos in my posts are edited using PicMonkey. I have a huge collection of sheepjes catona cotton. Will this be ok to us for Sophies universe? 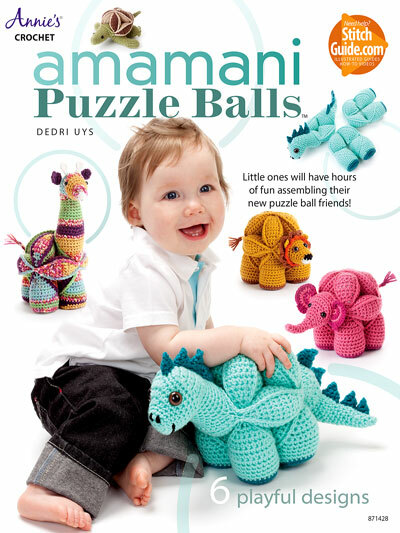 Can this be made with regular worsted weight 4 ply yarn? Thanks in advance. The Stonewashed (without the XL) is gorgeous. I have worked with it and I love it. It has the same appearance as the XL, but it is ever so slightly thicker than the cotton 8. I would use a 3.5 – 4 mm hook with it. Congratulations, you deserve it. I love love love your blog so much with very easy to understand detail photo tutorial just the one for me. 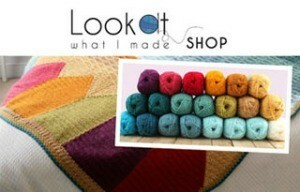 If only there is online shopping in my beautiful country Bhutan i would not miss those luxury yarns. Are these yarns over the top soft ? Love Sophie, love your talent. Thank you for sharing your heart and your passion with us. So well deserved. 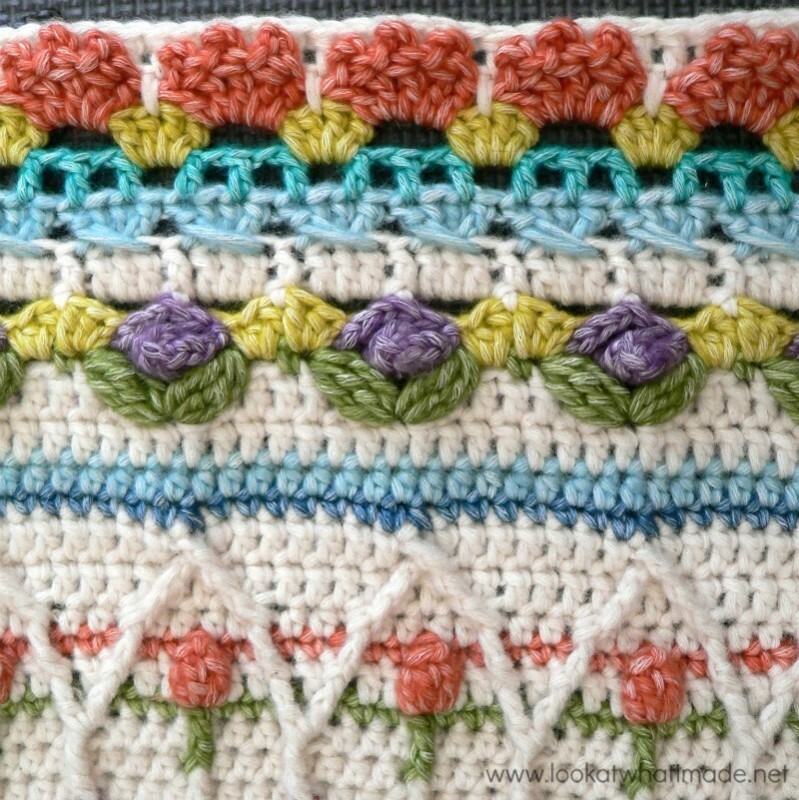 I discovered Scheepjes last year when I tried my first CAL which used cotton 8. Loved the yarn and the CAL and have been hooked ever since! Awaiting my next yarn pack of Scheepjes to begin their next CAL but loving Sophie in the meantime! 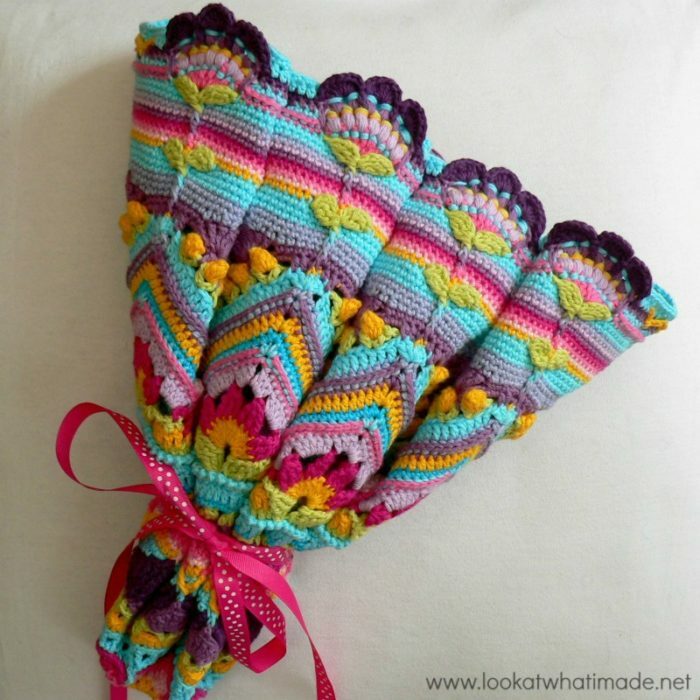 Thank you so much for your wonderful design and encouraging beginner crocheters like me! 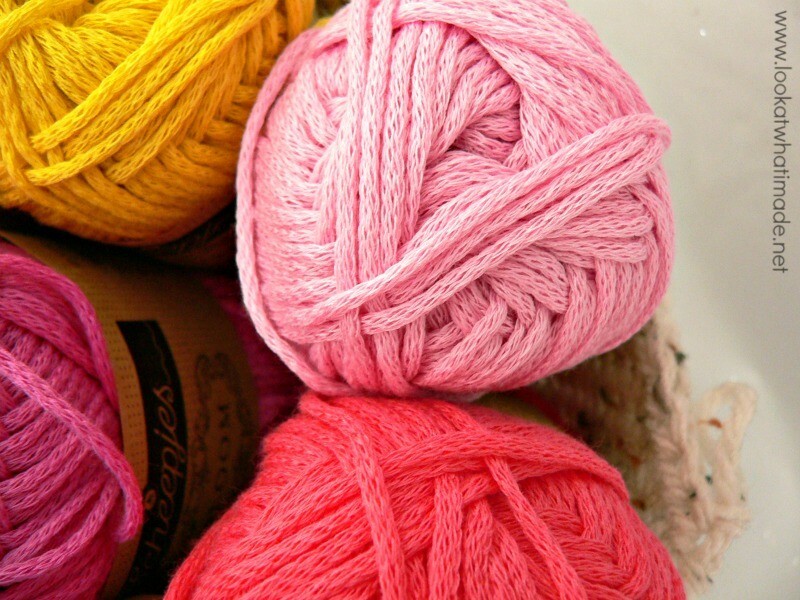 The cotton yarn you mentioned nearly at the end of your blog. How nice is it really? 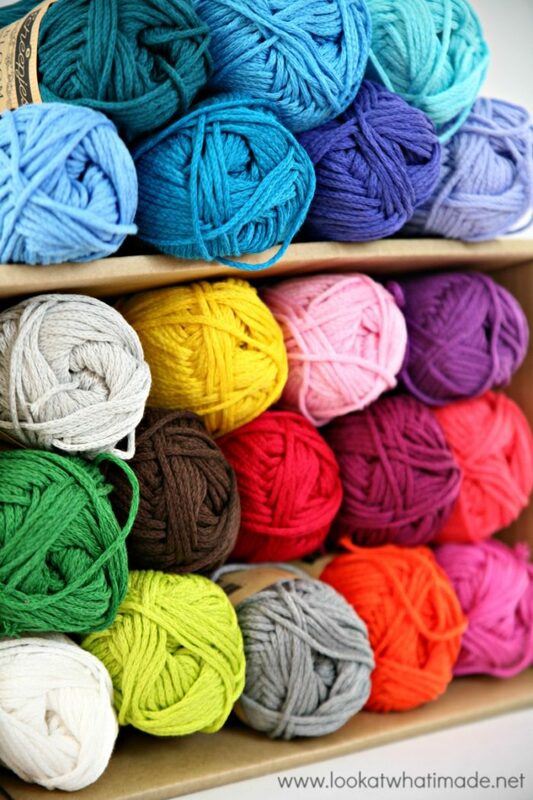 how does it feel, does it work up all, what skein size does it come in, how many colors are offered and what about price? Lastly can it be shipped to Greenland? Congratulations! 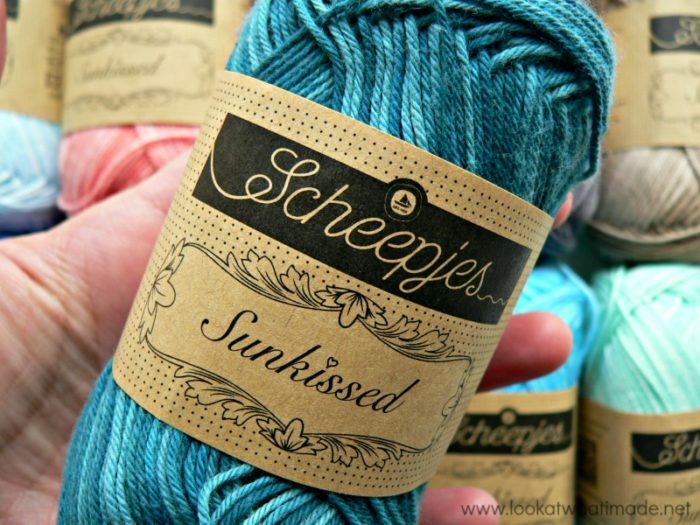 I’d never even heard of Scheepjeswol until you mentioned it in a post & I really just need to get some, I loved variegated yarn and that sunkissed range just looks yummy! 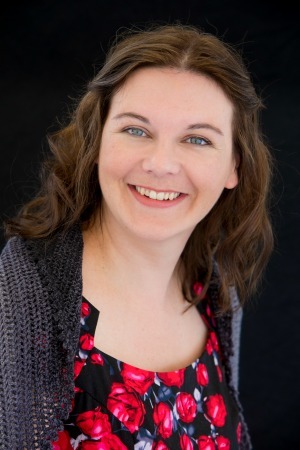 It is gorgeous to work with, Heather. Good for you! You are one amazing young woman,Dedri. 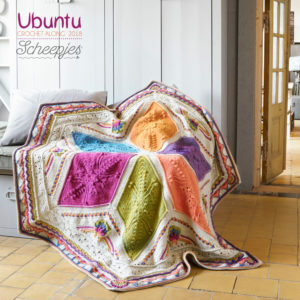 I seriously hope you get compensated as you are a true asset to Scheepjeswol; your review of their yarns makes me want to try them all. You’re my favorite blogger—creative and sincere. Best to you and your family. Congratulations on the new gig!! You did a terrific job with this Scheepjeswol post! I am eager to see your new blog posts.